Our main exhibit, The Dream of America: Swedish Immigration to Chicago, is located on the second floor of the Museum. The exhibit explores the struggles and triumphs of the Swedish immigrant experience and asks the question: would you leave home today in search of a better tomorrow? The exhibit follows Swedish immigrants from the arduous journey to the new world to building a life and community in Chicago. It examines topics such as why so many Swedes left their homeland and what they packed for their voyage, as well as careers they chose in the Chicago area and the social lives within their immigrant communities. Visitors will encounter authentic artifacts that reflect the experiences and perspectives of immigrants – from household items they brought from Sweden and travel items such as passports and steamship tickets to memorabilia from Chicago-based Swedish-American organizations and Swedish folk crafts produced in the United States and abroad. 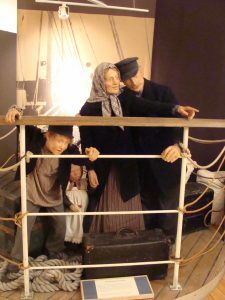 Visitors meet many characters within the exhibit, including, Stina Olofsdotter, who is helping her son prepare for his journey to America in 1868; Karl Karlson, whose family arrives in New York in 1893; and Elin Hedman and her daughter Birgitta who passed through Ellis Island in 1924.